For autumn/winter 2016, you need to watch your tone, son: specifically, your earth tones. Colours like khaki (which, incidentally, means ‘earth’ in Hindi), olive, sand and clay are ubiquitous, from the runway to the high street and the first promotional shots for the remake of Jumanji. You’ll also want to consult your Dulux chart for sienna, russet and ochre. In many ways, earth tones are the natural selection for autumn/winter – just take a look at a fallen leaf (which also neatly demonstrates that they all go together). But this season, their omnipresence is being fuelled by some artificial stimulants, such as powerful fashion brands and a certain omnipotent rapper with a God complex. As part of our commitment to keeping across this season’s key trends, we’ve done some serious spadework to compile a guide to earth tones. Can you dig it? Yes, you can now. The Fashion Week pack may have sneered at his foray into design, but hate him or love him like he loves himself, there’s no denying the all-pervasive influence of Kanye West. Subsequent Yee-sons have doubled down on other earth tones such as brown, rust and even dusty pink (if that can be called an earth tone). They’ve also doubled up. And when Kanye speaks, people listen: “He’s much more directly connected to the young male audience than some of the high-end designers might be.” Even though his prices are out of reach of all but the biggest ballers. Yeezy isn’t the only show in town that has been pushing earth tones: they’ve been all over London, Milan, Paris and New York. On that note, Topman Design unveiled velour and overcoats in earth tones, while Burberry interwove knits and track tops among the usual trench coats. Everyone from Canali to Coach via Boglioli and Brunello Cucinelli has entrenched themselves in earth tones. As well as taking earth tones mainstream, Yeezy (the man and the clothing line) has also been a big driver of the whole athleisure bandwagon. So perhaps unsurprisingly, some of the most widespread – and wearable – examples of earth tones are in sportswear. “Casual pieces are where this all started and earth tones work particularly well in jersey,” says Braun. “A crew-neck sweatshirt or a hoody in sand or stone is a great way to dip your toe into this trend.” Or your torso. Earth tone outerwear is obviously much more of a statement, both sartorially and credit card-wise. So if in doubt, start with a tee. Then when you feel more comfortable, maybe layer it under a similarly coloured sweat (see below). Earth tones are pretty versatile: they all go with each other, and most other things too. But to begin with, you don’t want too big a hole in your pocket. Unless it’s pre-ripped (also see below). As mentioned at the outset, Kanye has also popularised a sub-trend for layering up similar and even indistinguishable earth tones. If you want to demonstrate that you’re way above knowing what colours are in, then earth tone-on-tone is a next-level move that’s fairly easily achieved. But there are some pointers to bear in mind. As with any tone-on-tone look, it’s advisable to incorporate some variation in shade and/or texture, so you don’t wind up too one-note. If you’re layering olive green, and to a lesser extent khaki, just be conscious of the military connotations. Otherwise you’ll look like you really have been in the wars. 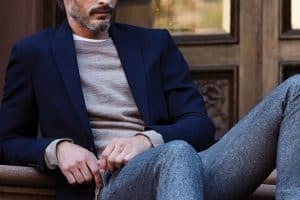 Again, this is less likely if you’re sporting sweats and joggers than uni-formal shirt and chinos, or a double-breasted greatcoat (maybe stick a hoody under it). Retailers are also awash with earth tone items that have been laundered and ripped, for which you can also thank Kanye. Too many holes though and the results can be wholly distressing. Not to mention more than a little Derelicte. Will you move heaven and earth to buy into this trend? Or are you getting that dirt off your shoulder? Leave a message on the tones in the comments.